Okon Joseph is a freelance writer well known for his unique, engaging and traffic generating content. He is also a passionate online entrepreneur and the founder of Weebo Media. Join his FREE Sales Room where he teaches small business owners and freelancers how to sell their products and services using the web and social media. Have you heard the word, “sales funnel” before? Do you know that making your first million dollars can be easily achieved if you have a sales funnel created for your online business? I bet there are many online marketers who don’t even know what a sales funnel is and how to use it to boost their online sales. If you are among those asking what is a sales funnel and how it works, then you should read this post till the end because it has answers to your questions. In this post, you will be learning about sales funnel and how you as an online marketer can apply it into your online business and accelerate sales faster. 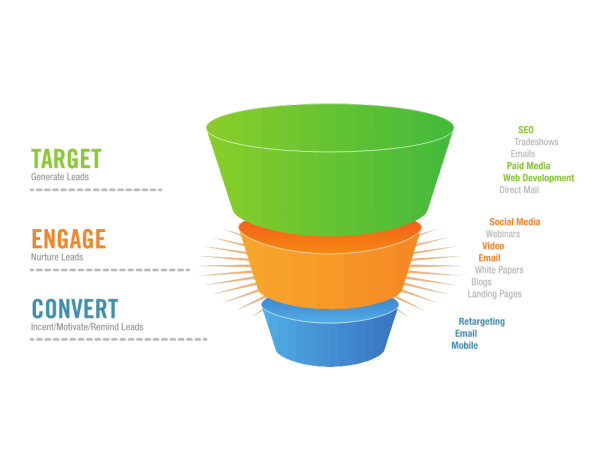 A sales funnel is also known as a marketing or product funnel. It is a series of steps designed by marketers and companies leading their customers to buy their products or services. It is an essential component in marketing. Most companies use sales funnel to create a relationship and build trust with first-time customers towards buying their products or services. This makes it easier for them to sell high-end tickets. The funnel is an array of products. Most times, it begins with a free or low priced product just to get customers coming into your funnel with the hope to sell your high end products in the future. Essentially, the goal is for the customers to go through the funnel, and at each stage, buy something. The products are arranged from cheapest to most expensive. The further the customer gets in the funnel, the more expensive products they buy. It is one of the easiest ways to sell products or services online. The best part of it is that the customers are the ones making the buying decision. They are the ones qualifying themselves and they may end up leaving the funnel buying up to 3 products. With a sales funnel, you don’t sell your products but sell yourself as a leader and a mentor while they decide if they want to buy what you prescribe. Just like a funnel, it has different stages. The top is where the process starts from and end at the small bottom. The first stage is the Awareness stage. This is where you create the awareness of the product or service that you will be using to lead potential customers into your funnel. The second stage is the Interest stage. Once people have landed on your landing page, they read your sales pitch and get interest in whatever you are offering. Your sales copy must be very enticing or else no one will be interested in your offer. When they get interested, you have likely hooked them with your sales letter and your freebie in exchange for their email address. The third stage is Engagement stage. At this stage, they are already in your funnel and are still evaluating if they should stay or opt-out. Keeping them is left for you because at this point you should be engaging them with valuable contents. The fourth stage is Commitment/Purchase stage. This is the point where you have built trust to the point the customers have decided to commit by buying your product and continue to buy over again. How to Build Your Own Sales Funnel for Your Business? A typical sales funnel starts with either a free product or a very cheap product between $1-$5. You can make it an eBook or a physical book where interested customers pay for shipping. The next product in your funnel should be an inexpensive one. The price should range between $10-$25 depending on what you are selling. It is just a way to take your customers to the bottom where your main high products are. If your customers end up buying this product, it is likely they will end up buying more before leaving your funnel if you have a way out. Every product after a previous one just have to be increasing in price and in quality. You're building the customers up, conditioning them to keep purchasing the next higher up product. If you do this effectively enough, they'll go through the complete sales funnel. And that's what your goal is. The end of your funnel can be a paid membership group priced between $25,000-$80,000 a year where subscribers have access to exclusive coaching course from you. Whether you are an affiliate marketer or a business owner who provide products or services, setting up a sales funnel is crucial to growing your business. If you don’t, you will end up leaving money on the table and also be stressing yourself trying to sell your products and services. This is how the top earners and companies make money. It is an attraction marketing that attract your target customers to you. I am an online entrepreneur and I have a sales funnel. Do you?